Help/Questions (Answered) > Is this a Whitall Tatum bottle? Is this a Whitall Tatum bottle? I found this at a local antiques mall, and was curious about the marking on the base. It's a fairly early bottle given the glass closure. The color of the bottle and the stopper is very light SCA. Too bad for the chip on the lip. 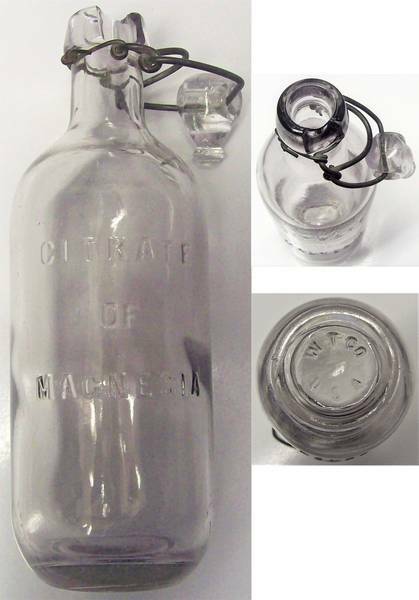 The front is embossed CITRATE/OF/MAGNESIA, and the base says W.T.CO./U.S.A. in a circle. Can someone confirm the maker? Thanks for any help. Eric H. responded: "I can tell you most definitely that this is a Whitall-Tatum bottle. WT manufactured gobs of these pharmaceutical bottles. The W T & CO was the earlier version before coming out with W T CO both embossings can be found on many apothecary, druggist, and pharmaceutical bottles. Also, side note in case you already didn't know, for some reason these Citrate bottles are all shaped like this...any time that you see this bottle shape, whether it states it or not on the bottle (most of the time it will) these are Citrate of Magnesia bottles." Thanks a lot for the info, Eric! Inquiries welcome.